A tiny island located in the Bahia de Buenavista, off the northern coast of the Cuban province of Villa Clara. It’s the smallest of the "Cayos de Villa Clara" (a.k.a. Cayeria del Norte), a popular beach resort destination that also includes the island of Cayo Santa Maria and Cayo Las Brujas. The names "Cayo Las Brujas" and "Cayo Ensenachos" are, however, less known because this popular destination is often simply refered as Cayo Santa Maria (its main island). 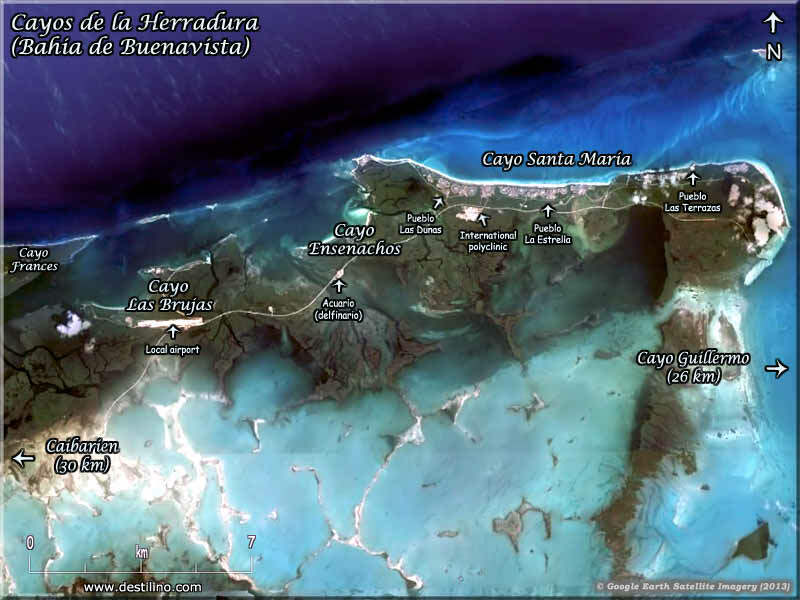 We had the chance to visit Cayo Ensenachos in 2002 when it was still virgin. Accessing back then this tiny island truly felt like finding a private little piece of paradise! The two pristine beaches were almost deserted, very few locals were enjoying the place. But we were not surprised when we learned that a luxury hotel was going to be built there. It's such a perfect setting. Click the following link to see pictures taken in 2002 (before the hotel was built). When the Ociidental Royal Hideaway opened, it was an adult-only resort. There was a clothing optional beach in the area of what is now Grand Village. This section has used by naturists for few years without any problem. In June 2011, the hotel management changed for Iberostar under the new name Iberostar Ensenachos, a family-oriented resort. At the beginning, it was OK as the clothing-optional sector was in a sector that stayed adult only. But eventually, the administrator advised that they will no longer accept nudism on the beach. It was a total lack of vision, as this section was far from the family sector. We keep monitoring this destination in case the status might changes. Please do not hesitate to contact us if you have any recent information (or comments) about naturism in Cuba. IMPORTANT! Read about the Naturism Etiquette in Cuba.